Wolves are set to host Manchester United at Molineux tonight for the second time in a matter of weeks. After falling to defeat at the hands of Burnley on Saturday Wolves will be looking to get back to winning ways, however, United may be out for revenge for Wolves dumping them out of the FA Cup. There are a number of options Nuno could go with tonight so let’s take a look. Ryan Bennett is free from suspension and could make his return to the starting XI. While Romain Saïss has done a solid job stepping in for Bennett, Nuno might be looking to change things around after the defeat which could mean Bennett returning to his usual position. Matt Doherty and Raúl Jiménez will be expected to start tonight after being on the subs bench for Burnley. However, other regulars may be rested in favour of the FA Cup semi-final on Sunday. Nuno could utilise a number of players instead such as Adama Traoré, Rúben Vinagre and Morgan Gibbs-White who have all impressed when introduced. As for Manchester United, according to BBC Sport, Anthony Martial has recovered from the knock he picked up on Saturday, while Romelu Lukaku and Victor Lindelof are both available. Alexis Sanchez, Antonio Valencia, Eric Bailly and Matteo Darmian all remain out. This will be the tenth Premier League fixture between United and Wolves, the Reds have won six and Wolves have won two. The only draw in those nine Premier League meetings was earlier this season when the teams drew 1-1 at Old Trafford. The last time United paid a league visit to Molineux in 2012 they won 5-0. Wolves are unbeaten against the Red Devils so far this season, having drawn with them at Old Trafford and beaten them at Molineux in the FA Cup. If they come out on top tonight, they will have beaten United twice in the same season for the first time since 1979-80. While some might say that Wolves victory last time out was part of “the magic of the cup” I disagree. Wolves matched United in the reverse fixture earlier on in the season and they have played very well against the big teams this season, earning 10 points against the established top six which is more than any of the other teams outside that group (W2, D4, L3). They’ve even gained a reputation for being “the giant killers” and should not be underestimated. 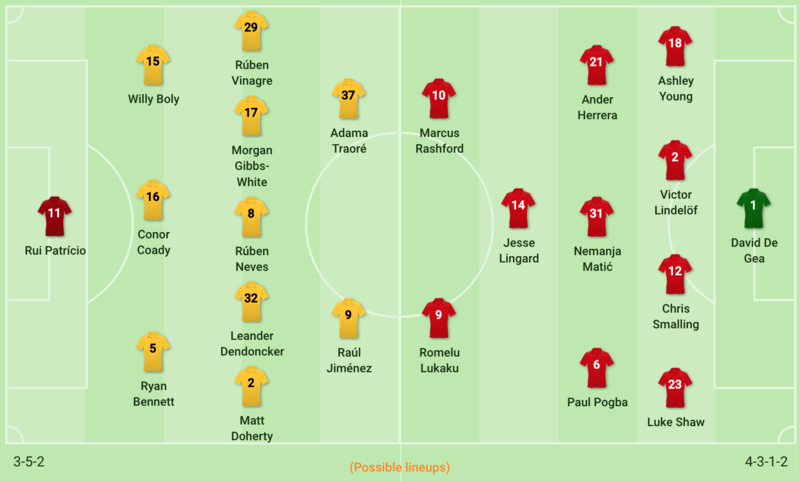 Both teams will be looking to pick up points here, and with Manchester United coming into this match off the back of a win against Watford and with a point to prove from the last meeting, they may have the upper hand. That’s not to say Wolves couldn’t get anything from the match. While it will be tough for the boys in gold and black with their trip to Wembley coming up this weekend, let’s not forget that Manchester United face Barcelona next week in the Champions League which is a big game for them. If Wolves can firm up defensively from Saturday they may have a chance of getting a point from this. Under the Molineux floodlights, with the crowd roaring them on, they’ll definitely have a shot. One of the main issues against Burnley was a lack of accuracy, especially when it came to crosses and long balls, so hopefully they’ll have been working on that in training to stop that being an issue again tonight. I’m going to predict both teams taking a share of the points with a 1-1 draw. Can Wolves win at Goodison for the first time since 1979?